A customary late goal at Kenilworth Road, this time at the right end, saw Luton Town progress to the second round of the Johnstone’s Paint Trophy with a 2-1 win over League Two pacesetters Leyton Orient last night. It had looked like Hatters’ fans would be put through the wringer of a penalty shootout for the second successive Tuesday, until a fifth last-gasp goal in six home matches, Stephen O’Donnell somehow deflecting Ryan Hall’s powerful drive into the top corner. Hatters had been forced to play the final 10 minutes a man light as well, when striker Jack Marriott was dismissed for what appeared to be a gesture made to the travelling fans. A morale-boosting victory was deserved for the home side though as manager John Still made seven changes, Luke Guttridge in for his first action of the season, with Mark Tyler, Steve McNulty, Danny Green, Pelly Ruddock Mpanzu, Olly Lee and Marriott all starting. Orient had the the first effort of note, Lloyd James’ shot saved by Tyler, before Luton started to take over, with Green’s corner volleyed wide by Scott Cuthbert. Green then began orchestrating affairs from his right flank, with some delightful deliveries that would have been perfect had Town possessed a target man in their ranks. The summer signing saw one wonderful cross inches above Marriott, while he then went for goal himself, with his effort deflected into the side-netting and from the corner, Scott Griffiths headed over the top. It then came as no surprise when the man of the moment Green put Hatters in front with an absolutely wonderful strike on 29 minutes. A low ball into Guttridge saw the midfielder excellently spin away from his man and feed Green who, on the angle, fairly hammered his shot beyond Grainger. Town then started knocking the ball about with real panache, with most of it starting through the highly impressive Lee, although they required a good stop from Tyler to keep it 1-0. Green, who else, came closest to doubling Luton’s lead after wonderful work by Ruddock Mpanzu saw him denied by the outstretched flailing leg of an O’s defender. In the second period, Hatters kept their tempo, with Lee continuing to dictate proceedings, as he sent Marriott away, the forward’s fierce shot deflected over and from another Green cross, Smith couldn’t divert it beyond Grainger. Orient started to improve immeasurably too as Blair Turgott shot straight at Tyler, while they won a penalty on 57 minutes as Cuthbert clipped Kashket with the Town defender immediately limping off for Magnus Okuonahe, who tasted his first competitive action since November 2014. Lloyd James made no mistake, sending Tyler the wrong way, but Hatters upped their game once more, Guttridge and the resurgent Griffiths going close, Lee shooting wide too. Back came the O’s though, Tyler making a superb low save from Ollie Palmer and when he was beaten by Kashket,McNulty pirouetted superbly on the line to hooked clear. 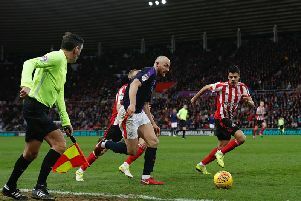 Marriott missed a free header on 80 minutes, and in the aftermath was shown a straight red by referee Nicholas Kinseley for his apparent gesture. Chances then came and went in an open final stanza, before O’Donnell managed to divert Hall’s shot past Grainger. Still, Orient could have forced penalties, as a long ball found Turgott in space, only for the striker to shanked over, meaning Luton, previous winners of the competition, went through. Hatters now head to the familiar surroundings of Cambridge United this weekend in an improved mood, with boss Still facing some serious selection issues as he searches for an opening league win. Hatters: Mark Tyler, Stephen O’Donnell, Scott Griffiths, Scott Cuthbert (Magnus Okuonghae 56), Steve McNulty (C), Danny Green (Josh McQuoid 85), Olly Lee, Jonathan Smith, Pelly Ruddock Mpanzu (Ryan Hall 72), Luke Guttridge, Jack Marriott. Subs not used: Elliot Justham, Craig Mackail-Smith. O’s: Charlie Grainger, Sean Clohessy (C, Freddy Moncur 46), Frazer Shaw, Connor Essam, Lloyd James (Myles Judd 83), Ollie Palmer (Sandro Semedo 88), Sammy Moore, Blair Turgott, Bradley Pritchard, Scott Kashet, Joe Maguire. Subs not used: Victor Adaboyejo, Gary Wood. Booked: James 36, McNulty 36, Shaw 89. Hatters MOM: Olly Lee. Once he got a handle on the midfield, proved to be a real driving force.